Nicolas Anelka, Medical Student: The Truth About Superfoods: Are They Just a Big Lie? 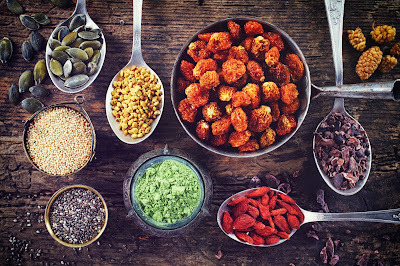 The Truth About Superfoods: Are They Just a Big Lie? The modern public is adopting a fresh focus, primarily geared towards healthy eating. Thus, we’ve seen a new buzzword emerge: superfoods. Superfoods have absolutely dominated discussions on physical, mental, and internal health. In fact, simply typing “superfood” into an online search can yield as much as 10 million results. While superfoods aren’t unhealthy, is it possible that superfoods are not quite as curative as most people believe? Let’s take a closer look at this from a medical perspective, and dissect these so-called superfoods. Superfoods are a category of foods—usually fruits and vegetables—that have exceptionally dense nutritional value. This is only a small sampling of the types of superfoods that are out there. Every list is different, which can make defining superfoods difficult. Quite honestly, it’s hard to deny that superfoods are just that—super. The debate is not about whether these foods are good for you. There’s no denying that an increased intake of protein, vitamins, minerals, fiber and antioxidants can be beneficial. · Protein: Aids the body in digestion, and helps to cultivate lean muscle mass, which works to burn off extra fat. · Vitamins & Minerals: Depending on what you choose, there is a host of benefits. Vitamins & minerals support every system in the body, including cardiovascular, immune, digestive, reproductive, and ocular processes, amongst others. · Fiber: Aids in digestion, keeping internal organs healthy and facilitating the elimination of waste produced by the body. · Antioxidants: Supports healthy cell development and regular metabolic processes. Many health experts, dieticians, nutritionists, and doctors have been applauding superfoods for their uncanny abilities to ward off disease. Some have claimed that superfoods can shield against cancer, or that they can reduce the risk of heart disease. Superfoods have even been attributed to slowing the aging process, easing arthritis, soothing inflammation, and managing diabetes. This prompts the question: Do goji berries, chia seeds, and coconut oil truly contain curative properties? While superfoods certainly contribute valuable nutrition, it’s important to keep in mind that studying nutritional value in a laboratory is much different than studying nutritional value in an actual diet. For example, when studying the beneficial effects of antioxidants—which have been shown to prevent and reverse memory decline in aging rats—antioxidant levels are much higher than what a typical diet would include. To see similar results, massive quantities of antioxidants would need to be consumed, which simply isn’t practical in a healthy diet. Another consideration to take is that these positive physiological benefits occur in the short-term. Thus, to experience long-lasting results, many superfoods would need to be consumed on a regular basis—and in high quantities. For most diets, this would create unintentional adverse side effects. For example, pomegranate juice is a superfood which has been applauded for its ability to lower blood pressure and consequently prevent heart disease. Most nutritionists and doctors would agree that ingesting large quantities of pomegranate juice, however, would be ill-advised. One cup of pomegranate juice contains an average of 31 grams of sugar. Drinking all that sugar can create weight gain, cardiovascular issues, and diabetes, making it difficult to consume enough pomegranate juice to reap health benefits. Perhaps the growing issue concerning the value of superfoods is that they have been talked about so extensively, with their curative properties expanding into incredible proportions. Rather than simply being healthy additions to a diet, superfoods are often credited as the “end-all” solution to some of the most common illnesses and ailments. Now, the phrase “superfoods” has largely become a marketing tactic, attracting consumers to expensive, nutrient-rich foods. The truth about superfoods is that, while they certainly have great nutritional value, their health benefits have simply been blown out of proportion. From a medical standpoint, a healthy diet stems from variation, nutrients, and moderation. Reaping the advertised health benefits of these superfoods would take massive consumption over extended periods of time, preventing a truly balanced and healthy diet. Focusing primarily on superfoods goes directly against cultivating a healthy diet. Unfortunately, the culture of modern nutrition is putting superfoods on a pedestal that they simply cannot earn.